The agricultural subsector of animal production is part of a complex interdependent farming system. Analysis of livestock production cannot be based solely on input and output, but must also take into consideration other farming activities. The interaction between animal production and other subsectors can be complementary, as in the use of manure; or competitive, as in the allocation of land to crops or livestock grazing. The farming system as a whole, and animal production in particular, is influenced by external factors (including government policy on rural development, livestock development programmes and marketing), which must be considered in any analysis or evaluation. The farming system is defined as the combination of all farm enterprises/subsystems, management and farmer objectives and the interaction between them. It is a decision-making and land-use unit, comprising the farming household and the crop and livestock systems, which transforms land, labour, management and capital into products that can be consumed or sold. Enterprises/subsystems are defined as the different subdivisions of the farming system, each producing one kind of crop or livestock product. In the case of family poultry, the products are poultry meat and eggs, with manure as a by-product. The harvesting of family poultry for home consumption and sale can be considered as the management of a standing resource for economic yield. In this respect, the economic principles applying to the management of fauna, parklands, fisheries, wood and timber forests and rangelands are more appropriate than the economic concepts more commonly applied to the labour and capital-dependent livestock production and other commercial farming industries. The cost of production can be seen from various angles. The inputs may be external (Non-Factor costs) or internal (Factor costs). Internal input is under the control of the farming household, and includes land, labour, management and capital. The cash involved in production represents either Cash (Paid) Costs or Non-Cash (Calculated) Costs. Another way to categorize the costs is to distinguish Variable Costs from Fixed Costs. Variable costs rise and fall with the size of the output and the level of the operation. Variable costs (for items such as feed, vaccine and casual labour) can be controlled to some extent and are not incurred when there is no production. Fixed costs (for items such as taxes, insurance, interest, and depreciation on buildings and equipment), are incurred whether or not there is any output. The Opportunity Cost principle is applied in farm cost accounting. Opportunity costs can be defined as the "income that would have been generated if the production resource/input/factor were put to the next best alternative use". Many farm enterprises/subsystems yield more than one product. Poultry produce eggs, meat and manure. When calculating the cost-price per unit of production, the cash value of the by-products (sold externally or used as a substitute in another enterprise/subsystem of the farm), must be subtracted from the Total Gross Costs. This will result in the Total Net Costs. For the cost-price per unit of production, the Total Net Costs must be divided by the total number of units of production. labour supplied by the farm family. Calculated Costs include Opportunity Costs as related to the national economy: for example, unemployment (including hidden unemployment) and high rates of devaluation of the national currency. These form a part of the socio-economic reality for the smallholder, and influence the Opportunity Cost of labour (reduced by high unemployment) and of capital (which tends to move towards zero when the rate of currency devaluation is higher than the interest rate). By making use of locally available and renewable materials for poultry housing and equipment, family poultry producers minimize the introduction of external capital into their enterprise. Large-scale poultry production cannot really be compared with smallholder family poultry, because smallholders often face such constraints as the absence of organized marketing systems and the lack of price rewards for produce quality and uniformity. Therefore, the cost-price calculation for large-scale poultry production (and also that for free-range commercial poultry production) may not be applicable to smallholder family poultry systems without modifications. 50 percent for free-range systems at 0.04 birds/m2 (400 birds/ha). A comparison of the EC cage minimum as a base, with perchery and free-range alternatives, is shown in Table 8.1. All economic activity consists of transforming resources (land, labour and capital) into goods and services which serve the needs and desires of people. Much of the quantitative assessment in cost-benefit analysis is simple accountancy: assigning monetary values to various measured or estimated physical quantities, categorizing them under a cost or benefit heading, adding them up, and finally comparing the totals. Proper economic analysis should provide a framework by which the benefits of production are shown in the economic system, and how these benefits are valued by society. This can only be done with a "before and after" or "with or without" analysis. an economic component which reflects the value placed by society on those supplies. The technical effects are demonstrated in an economic analysis as a shift of the supply curve - the basic relationship showing the minimum price at which different levels of production can be made available to the market. This is shown in Figure 8.1 as the downward shift in the curve S0 to S1. The value placed on this change in potential availability is then entirely dependent on the demand for poultry products. With rising demand for these products, additional supplies become expensive, and therefore the extra production translates into a substantial gain in benefits to the community. It can be argued that this usually happens in developing countries where, compared to the staple diet, poultry products are a luxury commodity with a relatively higher value. 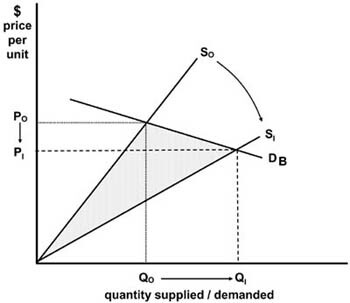 Hence, the demand curve D shows that the quantity demanded is highly responsive to price and income changes, with additional consumption causing little decrease in value. The demand for poultry products is price/income elastic. This simple model highlights the overall economic impact of higher poultry production as manifested on the market for poultry products. Production and consumption rise from Q0 to Q1 but the average price paid by consumers (and received by producers) falls from P0 to P1. Consumers gain significantly, reaping the benefits of both greater supplies and lower prices. Producers also gain. Although unit costs fall, the increase in production compensates for the price reduction and, as evident from the diagram, total revenue received by producers, (P1Q1) is greater than the previous P0Q0. The overall net economic benefit from improved family poultry production technology is represented by the size of the shaded area. It is this net economic benefit that an economic analysis of family poultry development schemes and programmes should be seeking to estimate.